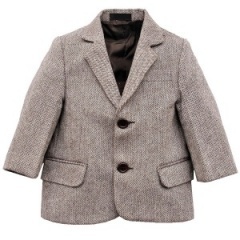 Brown tweed herringbone 4 piece suit for baby boys, toddler or older boy, perfect for a pageboy, guest at a wedding or other special occasions. 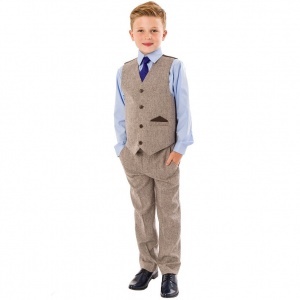 Waistcoat: Light brown tweed fabric waistcoat, woven with a herringbone pattern, fully lined, pocket with a contrasting mock handkerchief, 3 brown centre buttons, plain dark brown back, adjustable strap/buckle on back for perfect fit. 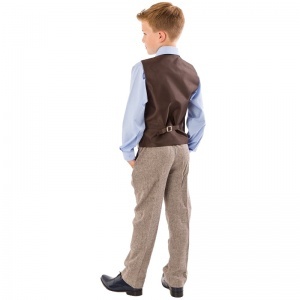 Trousers: Matching tweed herringbone trousers, button fly, double pockets, belt hoops, elasticated on rear. Shirt: Long sleeved blue shirt, full-length centre buttons, buttoned cuffs, down-collar, perfect compliment to the waistcoat. 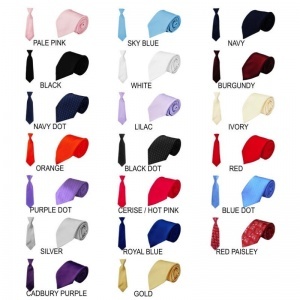 Tie: Satin effect royal blue tie, elasticated neckband, complimenting the suit perfectly. 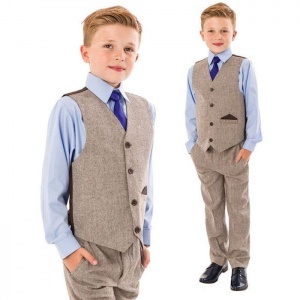 This 4 piece outfit will make him look like the perfect handsome gentleman at any occasion. 0-3 Months 23cm / 9" 35.5cm / 14" 40cm - 46cm / 16" - 18" 46cm / 18" 51cm / 20" 16.5cm / 6½" 20½cm / 8" 24cm / 9½"
3-6 Months 24cm / 9½" 38cm / 15" 43cm - 48cm / 17" - 19" 50cm / 20" 57cm / 22½" 18.5cm / 7¼" 23cm / 9" 26.5cm / 10½"
6-9 Months 25cm / 10" 40cm / 16" 43cm - 48cm / 17" - 19" 52cm / 20½" 58cm / 23" 20.5cm / 8" 24cm / 9½" 28cm / 11"
9-12 Months 25cm / 10" 40cm / 16" 44.5cm - 49.5cm / 17½" - 19½" 56cm / 22" 61cm / 24" 20.5cm / 8" 27cm / 10½" 29cm / 11½"
12-18 Months 26.5cm / 10½" 43cm / 17" 44.5cm - 49.5cm / 17½" - 19½" 58.5cm / 23" 64cm / 25" 23cm / 9" 28cm / 11" 30.5cm / 12"
18-24 Months 30.5cm / 12" 47cm / 18½" 46cm - 50cm / 18" - 20" 61cm / 24" 66cm / 26" 25.5cm / 10" 30.5cm / 12" 30.5cm / 12"
2 Years 33cm / 13" 50cm / 20" 49cm - 53.5cm / 19" - 21" 61cm / 24" 67cm / 26½" 27cm / 10½" 34cm / 13½" 32cm / 12½"
3 Years 39cm / 15½" 56cm / 22" 49cm - 53.5cm / 19" - 21" 63.5cm / 25" 68.5cm / 27" 31cm / 12" 37cm / 14½" 32cm / 12½"
4 Years 46cm / 18" 64cm / 25" 51cm - 56cm / 20" - 22" 63.5cm / 25" 73.5cm / 29" 32cm / 12½" 39cm / 15½" 32cm / 12½"
5 Years 48cm / 19" 71cm / 28" 51cm - 56cm / 20" - 22" 66cm / 26" 76cm / 30" 33cm / 13" 41cm / 16" 33cm / 13"
6 Years 56cm / 22" 79cm / 31" 53.5cm - 58.5cm / 21" - 23" 66cm / 26" 76cm / 30" 34cm / 13½" 42cm / 16½" 33cm / 13"
7 Years 57cm / 22½" 80cm / 31½" 53.5cm - 58.5cm / 21" - 23" 68cm / 27" 77.5cm / 30½" 38cm / 15" 45.5cm / 18" 35.5cm / 14"
8 Years 57cm / 22½" 81cm / 32" 56cm - 62cm / 22" - 24" 68cm / 27" 84cm / 33" 39.5cm / 15½" 49cm / 19" 35.5cm / 14"
9 Years 60cm / 23½" 82.5cm / 32½" 61cm - 66cm / 24" - 26" 71cm / 28" 86cm / 34" 42cm / 16½" 49.5cm / 19½" 38cm / 15"
10 Years 65cm / 25½" 88cm / 34½" 63.5cm - 68.5cm / 25" - 27" 76cm / 30" 86cm / 34" 42cm / 16½" 51cm / 20" 38cm / 15"
11 Years 68.5cm / 27" 93cm / 36½" 63.5cm - 73.5cm / 25" - 29" 81cm / 32" 89cm / 35" 44cm / 17½" 53.5cm / 21" 38cm / 15"
12 Years 73.5cm / 29" 95.5cm / 37½" 63.5cm - 73.5cm / 25" - 29" 81cm / 32" 89cm / 35" 44cm / 17½" 53.5cm / 21" 38cm / 15"
13 Years 77cm / 30½" 99cm / 39" 68.5cm - 76cm / 27" - 30" 86cm / 34" 91.5cm / 36" 52cm / 20½" 62cm / 24½" 38cm / 15"
14 Years 80cm / 31½" 104cm / 41" 71cm - 79cm / 28" - 31" 88cm / 34½" 91.5cm / 36" 53.5cm / 21" 64cm / 25" 40cm / 16"
Really pleased with this suit, good quality and delivered quickly. It was perfect for my son’s christening. My baby who is 6 months old looked so cute in this outfit. 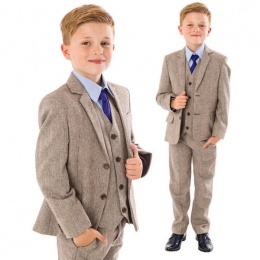 Bought the 9-12mth suit for our son's christening and were so pleased we did, with both the quick delivery and quality of the suit. He looked very handsome and smart on the day. Wouldn't hesitate to order from you again. 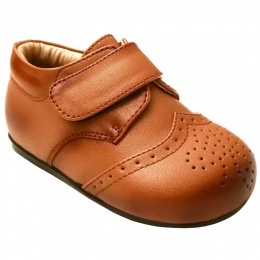 Fantastic value for money, bought 3 of these in 12-18, 4 and 6 years and they all fit fine and look ever so cute. Can't wait for them to wear them in July! Fantastic purchase. Brilliant value for money, excellent quality. Our 8 year old son looked fabulous on his christening day.. thank you. Very satisfied with my purchase. Speedy delivery, great quality and cannot wait for my little man to wear it at a friends wedding in a couple of weeks! Would highly recommend this site!!! Bought this for grandson who was an usher at his uncle's wedding to match the suits of the grooms men. 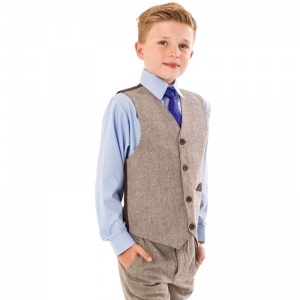 He is 8 years old and fits M&S age8-9,so bought age 9. Fit was fine for him. I was amazed at the low cost and really good quality. Replaced blue shirt for a white one and marroon bow tie. He looked very smart. A rustic style accessory for the little man who loves 'Batman'.